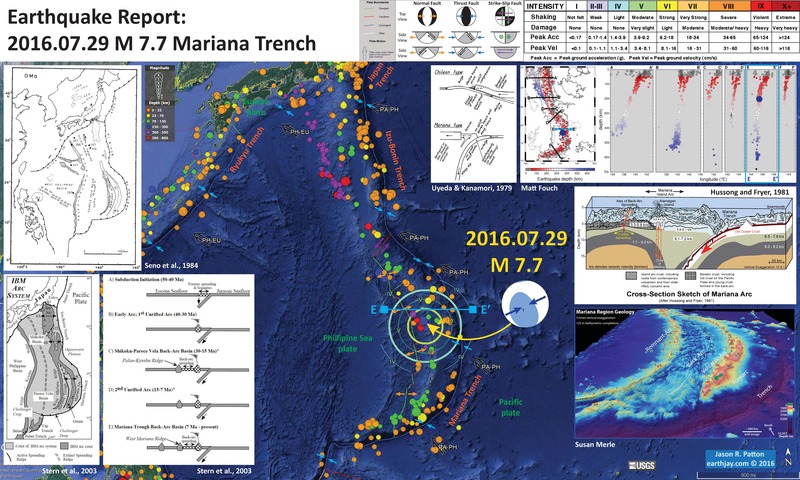 Earlier this year, there was an intermediate depth earthquake along the Mariana Trench with a magnitude of M 7.7. I was traveling and did not have the opportunity to prepare a report at the time. While getting together my annual summary I noticed this omission and prepared this report to compliment the remaining reports. Here is the USGS website for this earthquake. Intermediate depth earthquakes happen at hypocentral depths between 70 and 300 km and represent deformation within the downgoing lithosphere. The earthquake has an hypocentral depth of almost 200 km, so is unlikely to generate major ground motions at the surface (see the #EarthquakeReport interpretive poster below). After publishing (on 2016.12.28), I will change the publication date to 2016.07.29. I plot the seismicity from the past year, with color representing depth and diameter representing magnitude (see legend). I also include a blue line (labeled E-E’) that aligns with the cross section shown on one of the inset figures below. I did not include the slab contours (Hayes et al., 2012), which are contours that represent the depth to the subduction zone fault. These are mostly based upon seismicity. The depths of the earthquakes have considerable error and do not all occur along the subduction zone faults, so these slab contours are simply the best estimate for the location of the fault. The hypocentral depth plots this close to the location of the fault as mapped by Hayes et al. (2012). These slab contours would have been difficult to see in the second map below, so I decided to leave them off of both maps. Instead, there is sufficient seismicity at sufficient depths with which to visualize the dipping megathrust faults (colors from shallow to deep: orange, yellow, green, blue, purple, and red). In the upper left corner I include a general plate tectonic map showing the plate boundary faults, oceanic ridges, and oceanic plateaus (Seno and Maruyama, 1984). In the lower left corner I include two figures. On the left is a regional tectonic map that shows how back arc spreading and arc volcanism have interacted to create the region. On the right is a cross-section at about 20 degrees North latitude. The cross-section shows how these elements interacted through time to result in the current configuration/geometry. In the lower right corner is a low-angle oblique view of the bathymetry of the Mariana Trench, volcanic arc, and back arc (Susan Merle). Above that is a cross section showing some specific components of the Mariana Trench region (Hussong et al., 1982). In the upper right corner is a plot of seismicity from Matt Fouch (using data from Engdahl et al., 1998 ). On the left is a map showing the epicenters colored for depth. On the right are hypocenters plotted along cross-sections for different locations as designated on the map. Cross section E-E; is just north of the M 7.7 earthquake. I show the M 7.7 earthquake on the map and the cross-section as a large blue dot. Note how the M 7.7 earthquake happened along a very steeply dipping part of the megathrust. I include this figure with more a detailed description below. This map shows earthquakes from 1900-2016 with magnitudes M ≥ 5.5. Here is the tectonic map of the region. Seno and Maruyama (1984) muse paleomagnetic data from sediment cores to reconstruct the plate tectonic geometry since the Eocene. I include their figure captions as a blockquote. Tectonic elements in the Philippine Sea, Deep Sea Drilling Project sites are indicated by solid squares with site numbers. I, B and G denote Izu Peninsula, Benin Islands and Guam, respectively. Volcanic ridges are spotted and remnant arcs are hatchured. Arrows indicate declination of paleomagnetism of two seamounts in the Sbikoku Basin (Vaccquier and Uyeda. 1957). Here is a video showing a flyover of the backarc region of the Mariana subduction zone as recorded by Bill Chadwick from Oregon State University. This is a link to the video embedded below (9 MB mp4). Here is a link to the YT version of this video. This is from the project at the Schmidt Ocean Institute. Here is another project along the Mariana backarc. This is an updated cross-section of the Uyeda and Maruyama (1984) end member types of subduction zones from Stern et al. (2002). There are many variables that might control earthquakes along subduction zones that are also not represented by this model. These other variables might include at least: thickness of sediment on incoming oceanic crust, roughness of incoming oceanic crust (possibly affected by the overlying sediment), convergence rate, hydrogeologic processes (in crust or sediment), etc. End-member types of subduction zones, based on the age of lithosphere being subducted (modified after Uyeda and Kanamori ). This shows the arc and backarc tectonic elements in this region (Stern et al., 2003). Generalized locality map for the Izu-Bonin-Mariana Arc system. Dashed line labeled STL = Sofugan Tectonic Line. This shows, in cross-section form, the magmatic evolution of the Back-Arc along the Mariana Trench (Stern et al., 2003). Simplified history of the IBM arc system. Shaded areas are magmatically inactive, cross-hatched areas are magmatically active. This is the cross section from Hussong and Fryer (1982) showing the crustal structure in the region of Deep Sea Drilling Project Site 60. More about this site is available online here. The upper panel is the original figure (showing the drill sites) and the lower panel is an updated version. These figures also show the velocity model in km/second (this shows how the seismic velocity varies through different materials). Note the rough incoming oceanic crust (see the Magellan Seamounts on the Pacific plate). The rough plate is also visible in the main poster above. 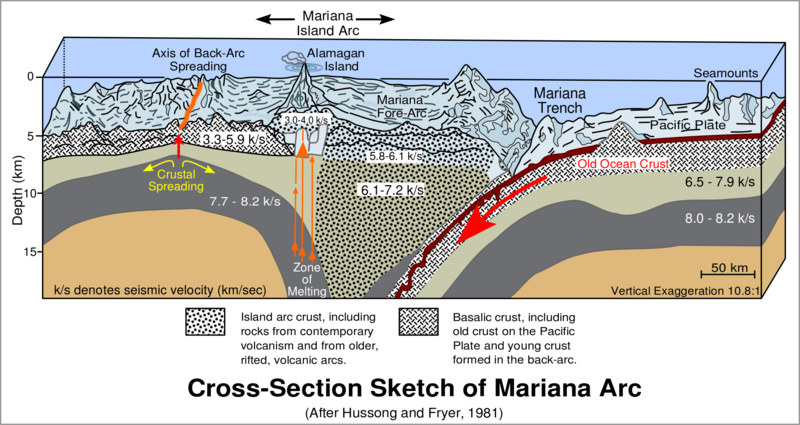 Physiographic diagram and crustal structure across the Mariana Trench and arc and the Mariana Trough, with Leg 60 site location shown. Crustal structure generalized from IODP site survey data by D. Hussong. Physiography drawn from IPOD site survey data by W. Coulbourn. This diagram summarizes the data and structural interpretations available prior to drilling. Here Stern (2010) updates the cross section of Uyeda and Kanamori (1979) even further. Comparison of Andean-type arc (a) and intra-oceanic arc system (b), greatly simplified. Here is the seismicity cross section prepared by Fouch also an inset in the poster above. Map view of bathymetry and seismicity in the IBM subduction zone using the earthquake catalog of Engdahl, van der Hilst & Buland 1998. Circles denote epicentral locations; lighter circles represent shallower events, darker circles represent deeper events. Black lines denote cross sectional areas depicted in 6 profiles on right, organized from N to S. Black circles represent hypocentral locations in volume ~60 km to each side of the lines shown on the map at left. Large variations in slab dip and maximum depth of seismicity are apparent. Distance along each section is measured from the magmatic arc. A) Northern Izu-Bonin region. Slab dip is ~45°; seismicity tapers off from ~175 km to ~300 km depth but increases around 400 km, and terminates at ~475 km. B) Central Izu Bonin region. Slab dip is nearly vertical; seismicity tapers off from ~100 km to ~325 km but increases in rate and extends horizontally around 500 km, and terminates at ~550 km. C) Southern Izu Bonin region. Slab dip is ~50°; seismicity is continuous to ~200 km, but a very few anomalous events are evident down to ~600 km. D) Northern Mariana region. Slab dip is ~60°; seismicity is continuous to ~375 km and terminates at ~400 km, but a very few anomalous events are evident down to ~600 km. E) Central Mariana region. Slab dip is vertical; seismicity tapers off slightly between ~275 km and ~575 km, but is essentially continuous. A pocket of deep events around 600 km exists, as well as 1 deep event at 680 km. F) Southern Mariana region. Slab dip is ~55°; seismicity is continuous to ~225 km, with an anomalous event at 375 km. This is a great synthesis figure showing the tectonics of the central Mariana Trench (Oakley et al., 2008 ). This shows the bathymetry of the central Mariana Trench, along with Multi Channel Seismic lines used to characterize the lithospheric structure and seismic velocity profiles. Regional location map. PSP, Philippine Sea Plate; PP, Pacific Plate; IBM, Izu-Bonin-Mariana Trenches; MT, Mariana Trough; WMR, West Mariana Ridge; PVB, Parece Vela Basin; PKR, Palau-Kushu Ridge; WPB, West Philippine Basin. Bathymetry of the central Mariana arc-trench system from combined surveys, sunlit from the east, showing EW0202 seismic lines. Interpreted lines are shown in red. Pacific Plate magnetic lineations from Nakanishi et al. [1992a] are drawn in white. This is a larger scale map showing the active bending moment normal faults in the subducting Pacific plate (mapped as black lines in the map on the left). Cross-section profiles are shown in the center. Note how the roughness of the Pacific plate may impart some topography to the upper plate (Oakley et al., 2008 ). This is a cross section showing the plate and mantle geometry, the sediment thickness, and the structures in this region. There is a comparison between what is on the incoming (subducting) plate with what is found along the outer Mariana Forearc. This figure brings together many of the details that may control both intraplate (crustal) and interplate (megathrust) seismicity (Oakey et al., 2008 ). Enlarged cross section along MCS Line 53–54 of the outer fore arc and subducting plate with numerically annotated features. To illustrate the deeper morphology in Region D, dotted lines show the bathymetry and subducted plate along MCS Line 79–80. This map shows some moment tensors as calculated by Emry et al. (2014). The authors evaluate the cause for the faulting in this region and associate seismicity plotted in this map as due to the extension in the outer rise. Relocated GCMT earthquakes in map view. Lower hemisphere stereographic projections for earthquakes are shown with compressional P wave quadrants (containing the T axis in black) and dilatational P wave quadrants (containing the P axis in white). The event numbers next to each focal mechanism correspond to Tables 2 and 4. The red arrow shows the angle of convergence of the Pacific plate relative to the Mariana fore arc as determined by Kato et al. . High-resolution bathymetry data in Northern and Central Mariana are from 2010 Mariana Law of the Sea Cruise [Gardner, 2010] and high-resolution bathymetry data in Southern Mariana are courtesy of F.Martinez. The color scale for bathymetry is positioned below and is the same for all bathymetric maps in the paper. (inset) Tectonic setting of the Philippine Sea. Bathymetry contours are shown by thin black lines. Subduction trenches are shown in blue; spreading centers are shown in red; transforms are shown in green. Here is a larger scale view of the bathymetry and moment tensors (Emry et al., 2014). The normal faults are easy to see in the bathymetry (e.g. the white lines on the right side of the map). Note how the moment tensors are aligned subparallel to the faults. (top) Relocated GCMT earthquake locations in map view. Lower hemisphere stereographic projections for earthquakes are shown with compressional quadrants (in black) and dilatational quadrants (in white). The red arrow shows the angle and rate of Pacific plate convergence relative to the fore arc as determined by Kato et al. . High-resolution bathymetry data are from Gardner . The bathymetry scale is the same as in [the figure above]. Inset shows the tectonic setting of the Mariana Islands. Bathymetry contours are shown by thin black lines. The trench axis is shown in blue; back-arc spreading center is in red; transform is in green. (bottom) Trench perpendicular cross section with the location of the subduction trench at 0 km; negative distances indicate the distance landward (or west of the trench) and positive distances indicate seaward distances (or east of the trench). Thick black lines show the bathymetry along (17.25°N, 147.3577°E) to (17.2752°N, 148.9311°E). Thick red lines show depth to the Moho used in our waveform inversion. Black squares show the depth to the plate interface at ~17°N from Oakley et al. ; red squares indicate the continuation of the Moho landward from the trench. Focal mechanisms for the region are rotated 90° into cross section. Dilatational quadrants are indicated by white while compressional quadrants are indicated by red. Vertical exaggeration (VE) is 1.5. These are model results that show an estimate for the changes in stresses in the crust due to flexure of the outer rise along the Mariana Trench (Emry et al., 2014). Seismicity is plotted along these cross sections. Note how the shallow region that experiences flexure also experiences extension up to more than 100 MPa. Note how the earthquakes in Central Mariana all occur in this region (in contrast to Southern Mariana). (top) The best fit flexure model for the Central Mariana outer rise using bathymetry seaward (east) of the trench axis. (bottom) The best fit flexure model for the Southern Mariana outer rise using bathymetry seaward (southeast) of the trench axis. Tensional deviatoric stresses correspond to blue regions and positive values (MPa); compression corresponds to red regions and negative values, and black regions indicate highly compressional stresses where the color scale has saturated. Extensional earthquakes plotted as white diamonds; strike-slip earthquakes are black crosses; compressional earthquakes are gray circles. Emry, E. L., Wiens, D. A., and Garcia-Castellanos, D., 2014. Faulting within the Pacific plate at the Mariana Trench: Implications for plate interface coupling and subduction of hydrous minerals, J. Geophys. Res. Solid Earth, 119, 3076–3095, doi:10.1002/2013JB010718. Engdahl, E.R>, van der Hilst, R., and Buland, R., 1998. Global Teleseismic Earthquake Relocation with Improved Travel Times and Procedures for Depth Determination in BSSSA v. 88, no. 3, p. 722-743. Oakley, A.J. ; Taylor, B.; Moore, G.F., 2008. Pacific Plate subduction beneath the central Mariana and Izu-Bonin fore-arcs: New insights from an old margin in Geochemistry, Geophysics, Geosystems. v. 9. doi:10.1029/2007gc001820. Stern, R. J. 2002. Subduction zones. Reviews of Geophysics, v. 40, doi:10.1029/2001RG000108. Stern, R. J., Fouch, M. J. & Klemperer, S. 2003. An overview of the Izu–Bonin–Mariana subduction factory. In: Eiler, J. (ed.) Inside the Subduction Factory. American Geophysical Union, Geophysical Monograph, 138, 175–222. Stern, R.J., 2010. The anatomy and ontogeny of modern intra-oceanic arc systems in Kusky, T. M., Zhai, M.-G. & Xiao, W. (eds) The Evolving Continents: Understanding Processes of Continental Growth. Geological Society, London, Special Publications, 338, 7–34. Uyeda and Kanamori, 1979. Back-Arc Opening and the Mode of Subduction in JGR, v. 84, no. B3, p. 1049-1061.